A few months ago I got a letter in the mail saying I was going to be summoned for jury duty. I filled out the information and returned it. A few weeks later I received the dates and it was a two week period over the weekend of the Christian Heritage conference and also my flight to Virgina. I requested to have it postponed and just found out today it was granted! I'll probably get summoned again later in the year which I'm not looking forward to since its a United States District Court and I'll have to drive to Seattle. Oh, well. Dad says it'll be a good experience once we get into the case. Hooray! We were praying for that. This is wonderful news - we are so happy! 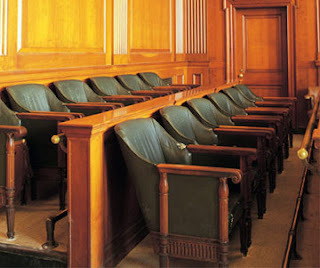 Jury duty will be a good experience, but better in the fall. Virgina!!!!!! "Do you think you'll send anyone to the electric chair, Aunt Bee?"